After a rocky last few weeks against Ivy League opponents, the Harvard women’s volleyball team (7-7, 2-3 Ivy) was able to turn the tides this weekend and pull off back-to-back sweeps. These unanticipated wins came against another pair of Ancient Eight rivals. On Friday, the Crimson took down the Pennsylvania Quakers (4-11, 0-4), keeping Penn from attaining its first conference win. Harvard faced a much fiercer opponent at the Malkin Athletic Center on Saturday, but a strong offensive effort by the Crimson was more than enough to sweep the conference-leading Princeton Tigers (11-5, 4-1). A standout game by captain Christina Cornelius was the highlight of Harvard’s victory against the Tigers on Saturday. The senior connected on 12 kills, leading the team in that category. Close behind was junior hitter Grace Roberts Burbank, who amassed 10 kills over the course of the game. The first match began as a defensive brawl between the two teams, as neither squad seemed to be able to pull away from the other. However, once both teams were tied at eight, the Crimson offense started on a hot streak, denying the Tigers any chance of taking back their early-game lead. For Harvard, the latter two matches were defined by momentum. Though the Crimson’s 8-3 lead at the start of the second match was threatened by a 3-0 run by the Tigers, the Harvard defense came alive and kept Princeton to 19 points. The Crimson sealed the deal with a game-changing kill from freshman Jaimie Rao. 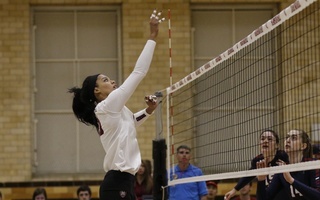 Offensive pressure from the Tigers during the third match put Harvard’s chance of securing a sweep in jeopardy, but a kill streak by Cornelius, coupled with a continued strong defensive performance by the Crimson, allowed Harvard to clinch the match, the game, and the sweep. This weekend’s games proved that this mentality has paid off for the Crimson. The Crimson’s win on Saturday gave Princeton its first conference loss this season, resulting in a three-way tie for first in the league between the Tigers, the Yale Bulldogs (10-4, 4-1), and the Cornell Big Red (9-6, 4-1). Harvard’s first match against Penn began in gridlock, with neither team appearing to have a strong advantage over the other. However, the intense point-for-point duel between the Crimson and the Quakers was ended with a powerful kill from Roberts Burbank, who paved the way for a Harvard hot streak. Two kills by Rao toward the backend of the game secured victory for the Crimson. The theme of gridlock persisted into the next two sets, as the cutthroat competition between Harvard and Penn only got closer. Both teams traded the lead throughout the entirety of the set, with the Crimson coming out on top after strong offensive pressure from the backend. However, the offensive battle between the two teams quickly turned to a defensive brawl during the third match, making for yet another tight game. The scoreboard displayed a tied match a total of nine times, resulting a heart-pounding 17-17 tie between the two teams at the tail end of the set. Blocking and ball-handling errors by the Quakers provided Harvard with the perfect opportunity to take the match, an opportunity that Meyer was sure to take. Two kills by the Springboro, Ohio, native clinched the game for the Crimson, handing Harvard its first conference win of the year. The Crimson’s Ancient Eight battles will continue next week as the team heads south of the Massachusetts border to take on Yale and the Brown Bears (8-7, 1-4). 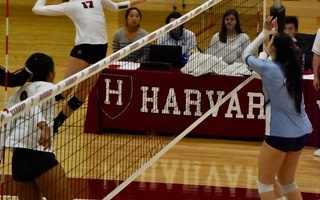 Junior outside hitter Grace Weghorst had 24 kills as Harvard erased an 0-2 deficit to win at home. 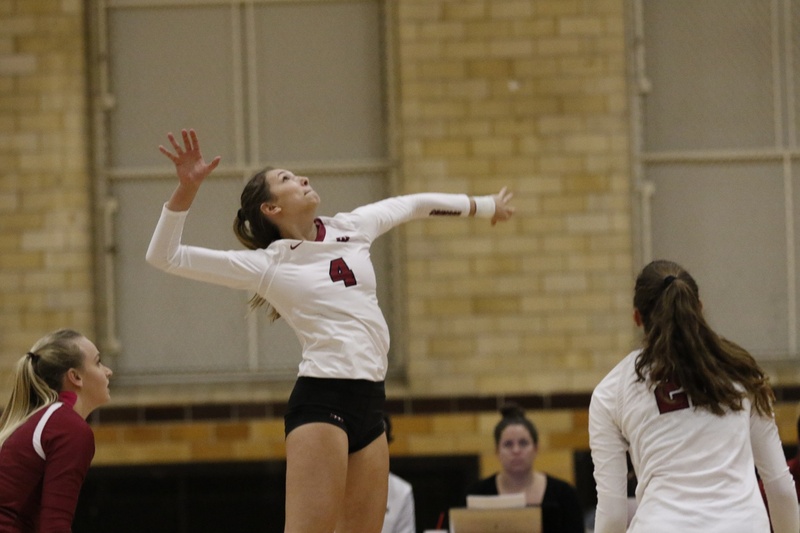 The Harvard women’s volleyball team put a difficult first weekend on the back burner as it captured its first two wins of the season in its second tournament of the campaign. At the Holiday Inn Invitational in Ohio this weekend, the Crimson defeated Wright State and Tennessee Tech but fell to West Virginia. Although still in the process of making adjustments as it readies itself for Ivy League play in two weeks, Harvard took this weekend as an important morale-booster. The penultimate weekend of play for the Harvard women’s volleyball team was marked by both excitement and disappointment as the Crimson found itself on both ends of upsets.